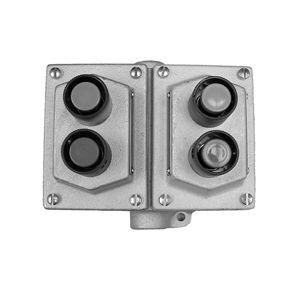 Crouse-Hinds Fed-through, pushbutton control station has a heavy-duty electro galvanized aluminum construction with acrylic painted Feraloy iron alloy finish for added durability. It has a mushroom headed push-bottom on the front of the control station for easy operation. NEMA 3 rated design of this control station ensures explosion-proof protection. This control station is suitable for chemical plants, oil and gas refineries, paint and varnish manufacturing plants, gasoline bulk loading, terminals, grain elevators and grain processing. Control station is UL listed and CSA certified.